When it comes to delivering e-cigarette liquid to a heating coil, the three most popular methods seem to be atomizers and hollow drip tips, tank systems like the eGo-Tank and cartomizers. Each of these liquid delivery systems has been my favorite at one time or another, but since I started using USA-made electronic cigarettes that operate at higher voltages I’ve gravitated more and more toward cartomizers. When I used an eGo battery, I loved dripping with low-resistance atomizers because of the high vapor production and purity of flavor. Once I switched to a high-voltage mod, though, atomizers gave me a lot of trouble because I couldn’t keep them wet enough for reliable operation at six volts without leaking liquid all over the body of the e-cigarette. That’s what made me decide to use an e-cigarette cartomizer instead. I’ve found that some cartomizers really shine at high voltages, and even if you’re using a standard 3.7 volt e-cigarette, you can’t beat an e-cigarette cartomizer for convenience. The polyfill design is the most common type of e-cigarette cartomizer available. It was the earliest cartomizer design I’m aware of, and all e-cigarette companies that sell pre-filled cartomizers use this model. Inside a polyfill cartomizer, you’ll find layers of gauze wrapped around a center tube with a wick and a vertical heating coil. The gauze saturates the wick, and the heating coil vaporizes the liquid and sends it out the top tube. The polyfill e-cigarette cartomizer is durable, reliable, easy to fill and has no trouble operating at high voltages. 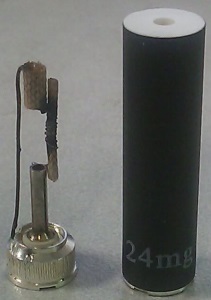 A wick-feeding e-cigarette cartomizer holds around 1 ml of liquid and has two wicks leading to a horizontal heating coil near the top of the unit. Although opaque versions of these cartomizers are available, a lot of people prefer “clearomizers” because they allow you to easily see when you need to add more liquid. However, clearomizers have two problems; some types of liquids — most notably those with cinnamon and citrus flavors — can crack the plastic. Also, the only drip tips that work well with clearomizers are rubber ones; hard plastic or metal drip tips can also crack the plastic. Because the heating coil is near the top, wick-feeding e-cigarette cartomizers tend to produce very hot vapor. Also, the wicks have to fight gravity and are sometimes unreliable; a confident e-smoker can fix this by taking a cartomizer apart and enlarging the openings for the wicks or by feathering the wick endings slightly with a sharp blade. I’ve never found that wick-feeding cartomizers perform well enough to be worth the trouble, though. They also make me nervous because I believe some may have fiberglass wicks. A bottom-coil e-cigarette cartomizer works with gravity by placing the heating coil at the bottom of the unit. Usually, with this type of design, the heating coil is isolated in a small chamber with a wick poking through to the liquid tank. As long as the e-cigarette cartomizer has enough liquid to keep the wick moist, it feeds reliably. 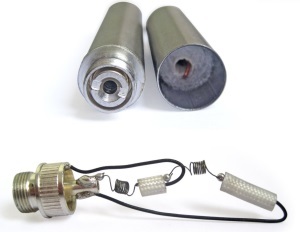 These cartomizers avoid the use of fiberglass wicks and may also contain no solder, making them potentially safer than other cartomizers according to the manufacturers’ claims. However, they also have some problems. 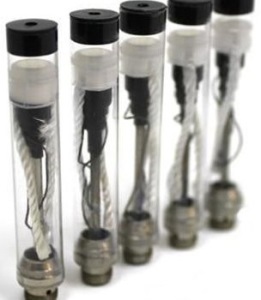 The long vapor tubes can sometimes become clogged with liquid, causing gurgling and decreased vapor production. Also, I’ve found that at higher voltages, bottom coil cartomizers sometimes vaporize liquid faster than they can feed it, leading to a burned taste. Also, bottom coil clearomizers generally work only with the included tips. If one heating coil is good, then for some, two coils are even better. A dual-coil e-cigarette cartomizer has two heating coils that vaporize liquid simultaneously when you activate the battery. Although many people who own dual-coil cartomizers love them, you’ll get the best performance with a large battery mod capable of outputting enough voltage to power both coils. If you use a dual-coil cartomizer with something like an eGo battery, you’ll be disappointed with the performance. The VaporFi VOX II is the best choice to use with dual-coil cartomizers because of its very high over-current limit. A tank cartomizer increases the liquid capacity of a standard polyfill cartomizer by submerging it in an acrylic tube. In this system, a hole is punched in the cartomizer to allow liquid to seep from the tank into the polyfill, keeping the coil(s) wet. The largest tank cartomizer I have seen holds as much as 7 ml of liquid — as much as seven standard cartomizers. People who have good experiences with tank cartomizers love them. I’ve found, though, that some can be unreliable, either leaking liquid or failing to feed it from the tank to the cartomizer. 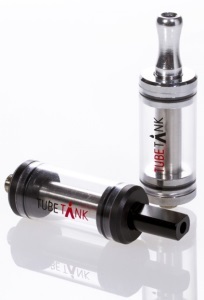 If you have a tank cartomizer that doesn’t feed properly, you may be able to fix it by removing the cartomizer and enlarging the hole on the side. The typical options available for polyfill cartomizers include resistance, size, threading and color. Look closely before buying, because few merchants are able to stock all of the different variations of this popular cartomizer.